Mental Health has quite rightly been given a much higher priority in terms of well being and its effect on overall health in recent times. Its great to see lighting being used to try and calm and assist those who are suffering to greater levels that a stay in a healthcare environment is required. HCL is now being used in so many different areas now including healthcare, educational and office environments allowing an individual the ability to have a much higher control of there own space is truly great to see. 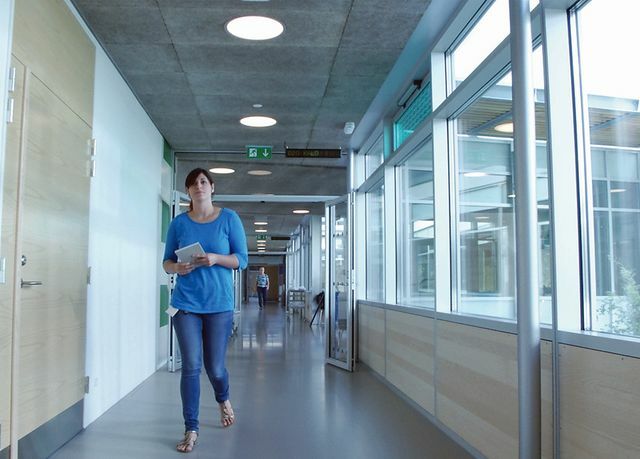 CUSTOMISED lighting has been installed in a Danish psychiatric hospital in a bid to cut aggressive behaviour and conflicts between patients and staff. The sophisticated dynamic circadian lighting system is now operational at the Esbjerg Psychiatric Hospital, 200 kilometres west of Copenhagen. The installation consists of 101 patient rooms with central wards that acts as a control room in which the light can be controlled. Each control room can adjust the colour temperature, colour and illuminance of the lighting in relation to each patient and their specific requirements. From here it is possible to switch between circadian light, emergency light and coloured lights.